This article shows how to use a USB cable connection to power a MIDI device. Why would you want to do this? These days USB sockets are a very common source of DC power. Many devices come with AC to DC converter transformers, and now hotel rooms, wall outlets, and automobiles are providing USB sockets as a source of DC power. MIDI devices, mostly used for making music, often require a dedicated wall transformer to give power. Some of the newer MIDI devices can use a USB cable to provide power. Some other MIDI devices can use the five pin MIDI DIN connector to provide power. 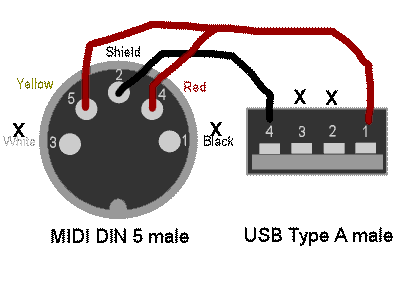 Depending on your MIDI device, you might have 3 or more wires to the device. This article shows how you can splice a cheap USB cable to a cheap MIDI cable to provide power to your MIDI device. Hopefully this saves you a cable or two and makes your music set up simpler. The diagram at right shows a schematic for this project. On the left is a five pin MIDI DIN connector and on the right is a four pin USB type A connector. You can select any of the MIDI or USB physical connectors for your application. The pin out is likely to be the same. My MIDI cable has the shield connected to DIN pin 2. Black and white signal wires are connected to DIN pins 1 and 3. Red and yellow wires are connected to DIN pins 4 and 5. My USB cable has power connected to pin 1, signals connected to pin 2 and 3, and ground connected to pin 4. For my application, I am trying to power a MIDI Solutions Quadra Merge box that allows multiple MIDI streams to merge into one MIDI input. I want a MIDI keyboard controller (Axiom 25) and a MIDI foot pedal controller (McMillen 12 Step) to input into the one and only input of my MIDI synthesizer (Roland SD-50). Unfortunately the MIDI synthesizer has only one socket, and I want more. Also, neither MIDI controller could provide power to the MIDI Quadra Merge. According to the MIDI Solutions FAQ: "You can connect an external +5V DC power source to the MIDI input of the MIDI Solutions product as follows: Connect the ground of the power source to the center pin of the MIDI input jack (pin 2), and connect +5V of the power source to the two pins on either side of the center pin (pins 4 and 5). The outermost pins may be left disconnected." The diagram shows the connections. Connect USB ground (pin 4) to the MIDI shield (shield and pin 2). If you are comfortable with schematics, splicing wires, and soldering, that is all you have to know from this article. If you would like more details and instruction read on. The photo at the right shows a cut MIDI cable. First use a cable cutter or razor knife to cut the MIDI cable to the proper length. Use the razor knife to cut back the protective outer sheath, but be careful not to cut the foil or braided sheath inside. Also don't cut the smaller power and signal wires within. Using a multi-meter or a continuity light, validate the copper braided sheath connects to DIN pin 2. The black, white, red, and yellow wires connect to DIN pins 1, 3, 4, and 5. Your wire colors may vary. The conectivity is what is important. In a similar manner, cut a USB cable to length and identify the wire connections to the connector. With my USB cable, the sheath and the black wire are connected to USB pin 4. The red, white, and yellow wires are connected to USB pin 1, 2, and 3. Using a soldering iron, connect the wires according to the diagram above. The photo at the right shows the connection of the ground wires and sheath. It is helpful to have a pair of "third hands" to hold the wires for soldering. The alligator clips also help draw off the soldering iron heat and prevent the wire insulation from melting. In my case, the interior wires were delicate, so I had to work quickly with a smaller iron tip and medium heat. You must insulate all your connections in order to prevent short circuits. For each of my wire connections I use shrink wrap tubing to cover any conductive metal. Once all wires were soldered and insulated, I also put shrink wrap over the entire splice point. To make the outer jacket more secure, I also covered the splice with black electrial tape. This photo shows the final test. On the left is a Skiva Tech Smart Quad transformer which provides 4 USB DC power ports of up to 2.4 amps each. On the right is the MIDI Solutions Quadra Merge happily powered up. Yes, this cable powering does take up one of the MIDI inputs. However, the advantage is that I did not have to pry open the Quadra Merge or drill or solder any connectors onto the device. In summary, my powered Quadra merge is now merging two MIDI controllers into my one port MIDI synthesizer. Mission accomplished. Thanks for visiting the site and reading the article. I hope you enjoyed the detailed photos and comments and will have more fun as a result. More articles are found at the parent Guitars and Music page. Last modified: Wednesday, 09-Dec-2015 06:20:39 MST.